The berserker is based on a member of the Ulfhednar, which was a certain type of berserker. If you do research and dig, you will find that these berserkers wore animal skins into battle, believing that they would be given prowess from Odin himself, and turn into that particular animal in battle. The Ulfhednar favored wolves, but sometimes used bear skins as well. 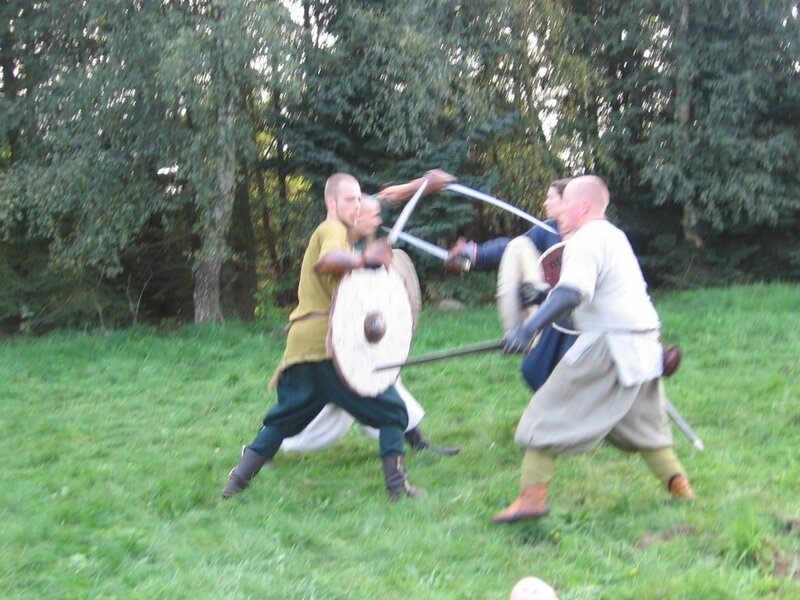 As for the clothing, a berserker does not represent a typical viking. Socially they were considered outcasts, and going into battle sometimes completely naked. Boots like those are not typical, but the exception being used in winter climates. I agree that the picture you showed is a typical viking shoe. The pants, I cant understand how pants can be classified as a certain type of pants vikings used. The Rus I could understand, because of the eastern influence, but other than that--pants were pants. They appear tight on him because we wanted to show the muscular build. Keep in mind, berserkers were elite shock troops. In the sagas there is an instance of a berserker who sat in a bar alone growling to himself, mimicking animal sounds like that of wolves and bears. He went challenging other men in a duel in which the prizes where all his belongings including his wife. He kept beating everyone he challenged, until the King was implored to, and dealt swiftly with Berserker. They were eventually considered too unstable, and dubbed outcasts, and were outlawed. So these guys werent your average fighter. These guys had strength above and beyond your average fighter, and we wanted to represent that by his above average muscular appearance. If you check the rest of the concepts regarding the viking teams those concepts fall with what you are familiar with in regards to the vikings.